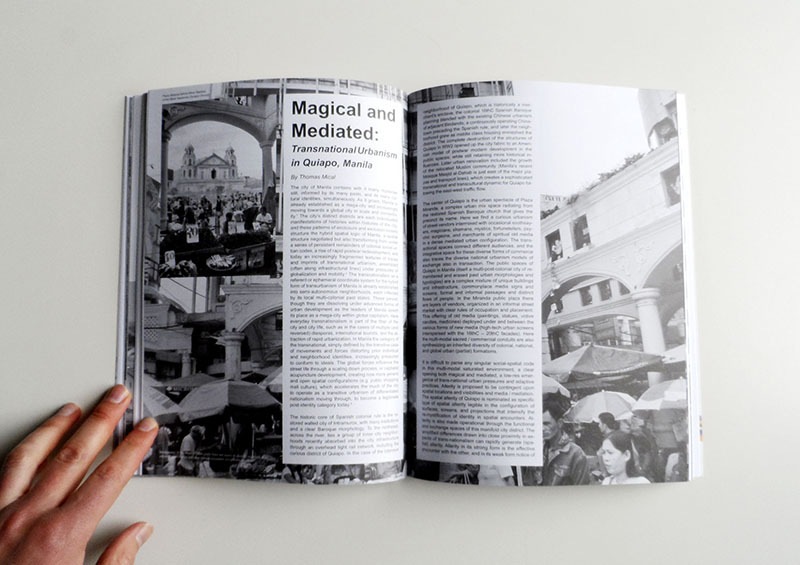 Continuing the conversation on urbanism, this issue of MONU Magazine picks up on a topic opened in MONU #8 on border urbanism. Transnational Urbanism expands the topic of trans-border relations between cities close to nation state borders, to interrogate the flux of exchanges that crisscross a multiplicity of borders. 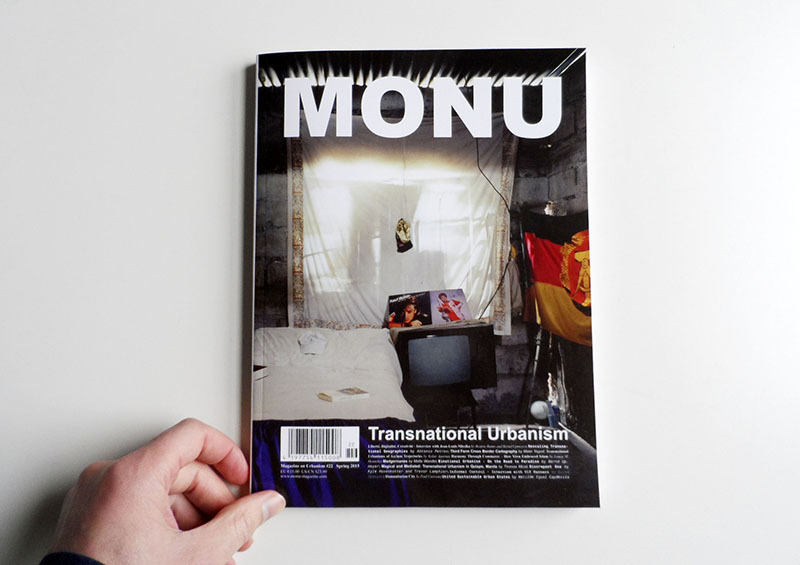 As MONU has accustomed its readers, architects, urban planners and designers, policy makers, sociologists, educators, photographers and filmmakers take part in the conversation. They make up a transnational community of researchers spanning from Rotterdam, the headquarters of MONU, to the United States, and East Asia, passing through Eastern Europe, Africa, and the Middle East. As Merve Bedir stresses in her essay, they themselves live intense transnational lives. I am a regular reader of MONU ever since my work colleagues got me a subscription for my birthday a couple of years ago. But when I got my copy of MONU #22 for reviewing, instead of zapping through it, like I normally do, I started reading it like a book and letting myself be guided by the editorial skills of Bernd Upmeyer. And what I discovered along the way was the conversation between the articles, as each of them builds on a thread launched by a previous one. 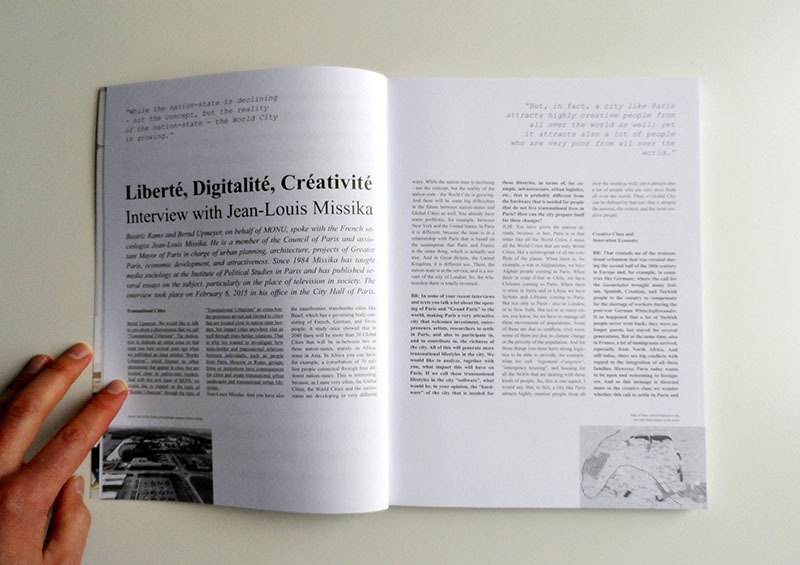 To begin with, as MONU’s trademark and opening piece, the interview in #22 is with sociologist Jean-Louis Missika, assistant mayor of Paris. He depicts an image of the global that comprises the world in itself. While Paris’s elected challenge is to provide shared infrastructure and housing for the global city’s mobile dwellers, Agatino Rizzo’s proposition for building a sustainable global city in between Malaysia and Singapore is to offer public space able to downplay social inequalities. What we read through the pages of this issue is the incredible porosity of borders, as even the most impenetrable of them, like the one between North and South Korea are crossed by cooperation and negotiation efforts that ultimately link joint economic, touristic, and knowledge spaces. Of course, as Yehre Sul shows, such projects are always at risk of being temporarily shut down by unpredicted incidents, or "the fog of international policy." We can equally read how conflict pushes established trade routes between countries officially at war underground, and reconfigures trade landscapes, as Arab traders reorient themselves to China after 9/11 and China’s joining the WTO. Caught up in between are Syrians and other asylum seekers whose trajectories are highly controlled and regulated. In spite of this, but also because of it, transnational friendships leak out of detention regimes, as Kolar Aparna’s research illustrates. Stories of work-migration present us the Philippine work-migration industry, and former Mozambican guest workers in the former German Democratic Republic caught in limbo as the fall of socialist regimes in the early nineties has only revealed their work as paying for their country’s debt. 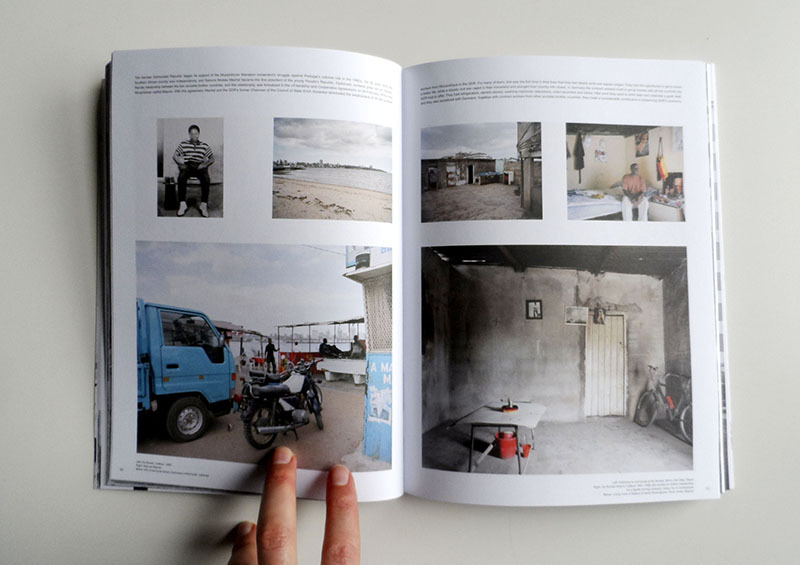 Splinters of the colonial gaze and the construction of "otherness" are shown to construct also "other" spaces, like the segregated spaces of Philippine workers in the Arab Emirates. Such gazes obscure sight and push urbanism into ‘magical’ interpretations, like the one offered by half architect – half media philosopher Thomas Mical. However, it is the constant effort of translation that constitutes "the challenge of transnationalism," as Kolar Aparna writes. Speaking from a European perspective, and the debate on closing the gates of "Fortress Europe," the articles in MONU #22 open up ways for understanding. In particular, one question is raised concerning African migration: how does it articulate with massive development projects around Africa’s mineral resources? 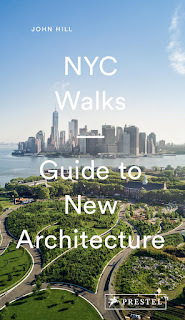 Architects and urban planners and designers are gaining momentum in border studies. 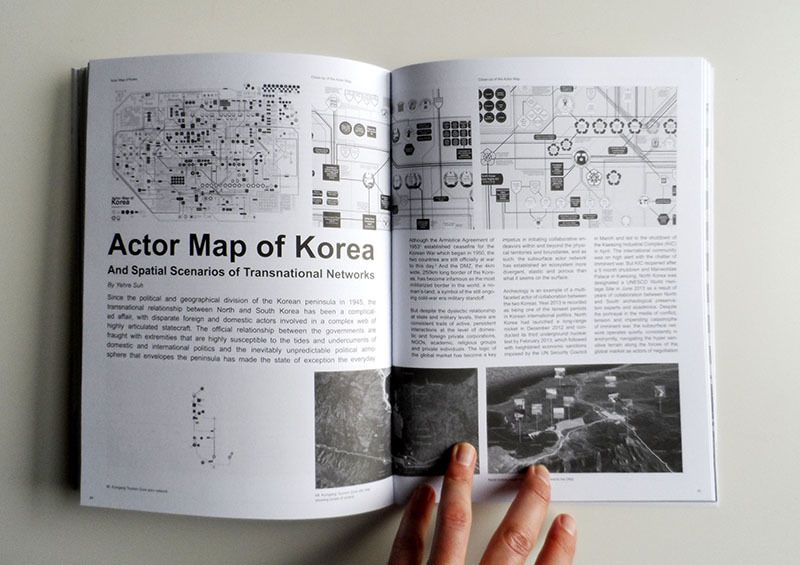 Next to MONU #22 on Transnational Urbanism, a recent conference at the Sheffield School of Architecture on Border Topologies in October 2014 is proof of the professions' deep engagement with this topic. 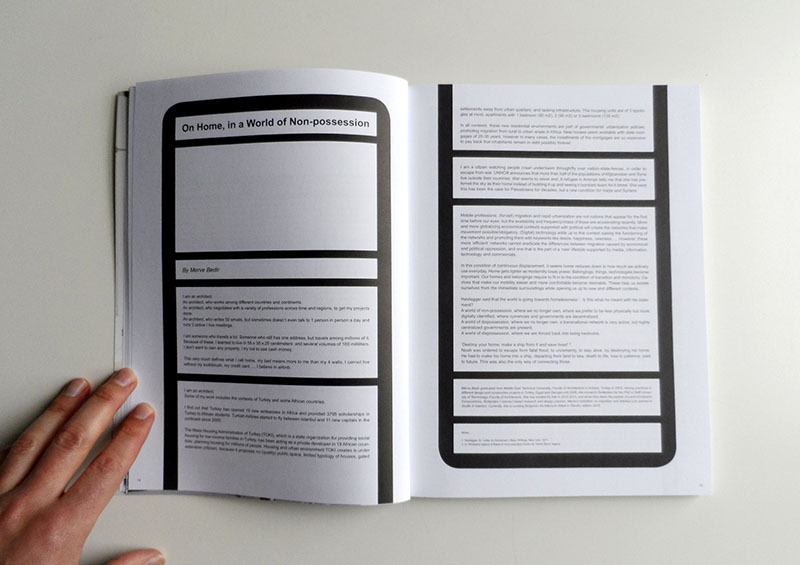 While MONU is definitely oriented towards the architectural profession, the current number tackles a trans-disciplinary theme, and that is what makes it such a good read, not only for architects. 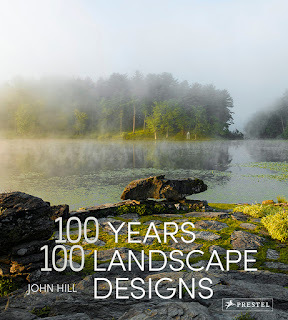 It represents a fresh alternative to a standard academic journal, as much of the articles are indeed by architects involved in academia. However, the freshness is in the practice, as Bernd Upmeyer’s editorial skills of construing a conversation from the different articles are definitely an architect’s trademark. Iulia Hurducaș is an architect and urban designer. After studying architecture and urbanism in Cluj, Romania, and Hamburg, Germany, she worked for the Romanian-German architecture practice Planwerk, in Cluj. She is currently pursuing a PhD at the Sheffield School of Architecture in the UK on the topic of transnational urban transformations.